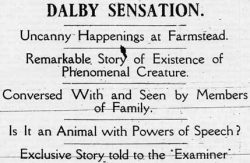 During the mid-1930s, British and overseas newspapers were full of incredible stories about Gef, a ‘talking mongoose’ or ‘man-weasel’ who had allegedly appeared in the home of a farming family in a remote district of the Isle of Man. This creature was said to have the ability to talk in several languages, to sing, to steal objects from nearby farms and to eavesdrop on local people, such that they became uneasy at the farmer’s seeming ability to be able to tell them their most private goings-on. 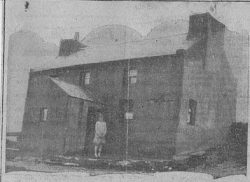 The farmer, James Irving, made contact with Harry Price, the celebrated investigator of the supernatural, and – in addition to spiritualists, psychotherapists, journalists and local dignitaries – Price and other ‘psychic detectives’ made the arduous journey up Dalby Mountain to visit Doarlish Cashen, the lonely farm at the centre of these extraordinary claims. Despite their written reports, magazine articles and books, several photographs of Gef, the talking mongoose (a.k.a. the ‘Dalby Spook’), fur samples and paw prints, voluminous correspondence and diary entries kept by James Irving and signed witness statements by people other than the family, there is still no consensus as to what had really been going on. Hoax? Mental illness? A poltergeist? The possession of an animal by an evil spirit? Now you can read all the evidence and decide for yourself. Seven years’ research and interviews, photographs (many previously unseen), interviews with surviving witnesses, visits to the site – all are presented here in this new book, the first to examine the case for over 70 years. You may be find yourself amused, bemused – and perhaps… a little frightened.